Register now for Visalia's one and only historic End of the Trail Half Marathon or 10k race. This may just be the flattest course in California! 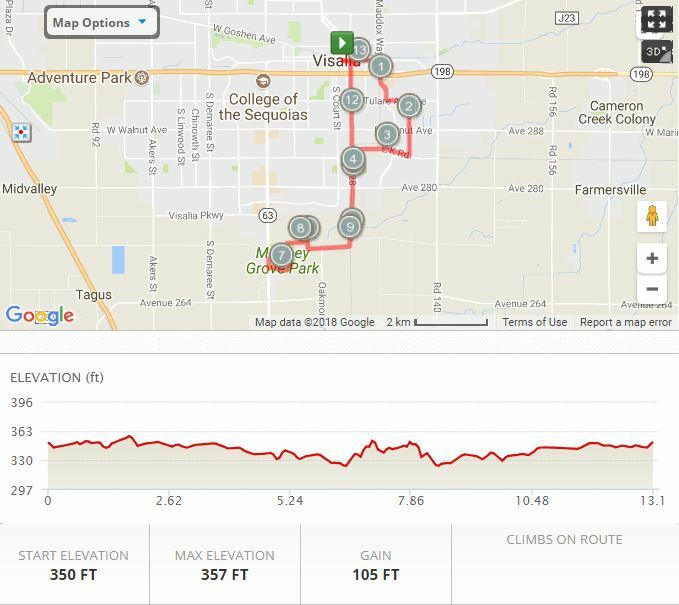 Whether you walk or run, join us for a memorable experience with a great route that starts and ends in downtown Visalia. One of the flattest race courses around. There will be a bag drop at the start line. Please use your Michelob Ultra Goody Bag to place any items inside that we will store for you during the race. Our drop off location will be next to the corrals on the south side of the road. Please mark your bag legibly with your first name, last name, and most importantly, bib number. Your bag can be retrieved at the finish line area. 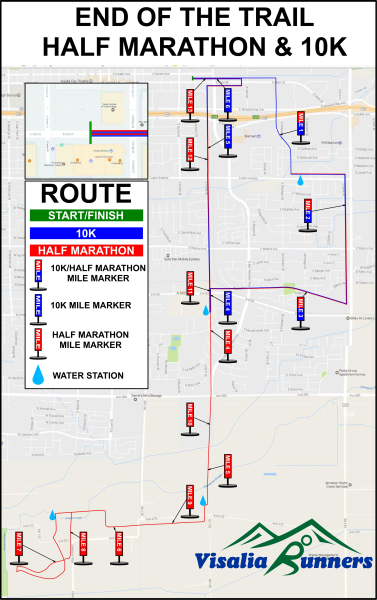 The Visalia Runners and The End of the Trail Half Marathon and 10K are not responsible for damaged, lost or stolen items at the bag drop. Your most comfortable running gear! If you are interested in volunteering then you are of course more than welcome! Please make sure to get in touch with End of the Trail and they will assist you with all the details. The Visalia Runners Tent will have merchandise for sale including the 2018 knee high compressions socks, from SB SOX, our Gold Sponsor. We also have 2018 and 2019 Beanies, Shirts, and select shirts for $1. There will also be merchandise for sale in the EXPO. We will be providing free race day photos that we will load onto our runsignup page around February 27th. Please login to your account to view and download them. Well organized race for this truly flat, fast course. Timing was accurate and posted quickly. The one suggestion would be at the 10k turn around and for those returning from the half turn around, a clear distinct path at this juncture a direction with which to navigate. This was my first time competing in this race. I would suggest that maybe one of your stations have gels! I think that would go a long way with the atheletes.